Allergies, Rashes, & Hot Spots... Oh My! Helping Fido & Kitty Stop Scratching & Itching. I’m afraid I might be allergic to allergies. If my patients have to get sick… I prefer they get a disease for which there is one known cause, which I can cure and which never comes back. Diseases like that can make us vets feel like heroes. Unfortunately, allergies are not one of those, and though itchy skin is not fatal– it sure is miserable. The term used to describe inhaled environmental allergies in dogs and people is atopy. The good news is that we can help Fido and Kitty feel much more comfortable-we know how to manage atopy in pets. The bad news is: atopy is a chronic relapsing disease. If neglected or mismanaged Fido will suffer from rashes, hot spots, ear infections, hair loss, skin infections, smells and misery or side effects of chronic use of corticosteroids. You see…. short of switching out Fido’s DNA for genes which do not predispose him to allergies, and short of asking you to pack Kitty and Fido and move them to the moon– there is not much that can be done to cure them of allergies. We can’t change our pets’ genetic predisposition to allergies, yet. And we will not eliminate grass, weeds, tree pollen, dust mites, mold, human dander, wool, fleas, bacteria, yeast, chemicals and perfumes from our planet–especially from the part of the planet known as Southern California, where our warm sunny weather and air pollution create perfect allergy conditions. But, we might be able to affect the overactive immune system by desensitization, as we will describe below. Let’s define what an allergy or atopy is. Then we will offer some thoughts on helping dogs’ itchy scratchy skin. Atopic allergies are an immunological overreaction (hypersensitivity) of the allergy patient to common stuff in their environment. Our and our pets’ immune system’s job is to destroy bad things like viruses, bacteria, fungi, parasites and abnormal cells (cancer). The immune system is an amazing army capable of exquisite communication, coordination and amplification of soldiers orchestrating destruction of things “out- to- get- us”. In the genetically sensitive individuals, however, the immune system gets “confused” and begins to overreact to proteins on stuff (pollen, dandruff, dust mites etc) which is ” not- out- to- get- them”. We call these proteins allergens or antigens. White blood cells (WBC) known as lymphocytes, or T-cells and B-cells, make a type of antibody known as IgE . When an IgE antibody encounters an allergen whose shape “fits” ( in a similar way that a key fits only the one lock) the two bind. Binding of antigens to IgE onmast cells triggers release of irritating chemicals like histamine and other inflammatory cytokines. This leads to itching, redness, irritation, and swelling or inflammation. 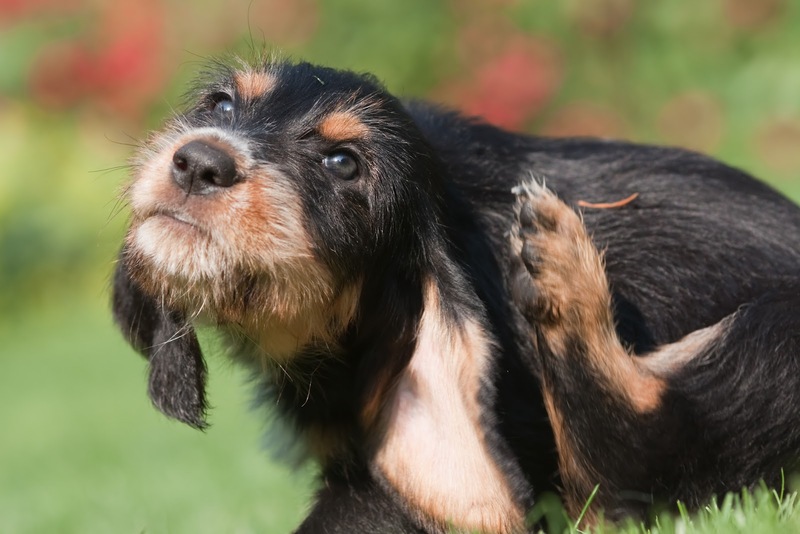 When the pet scratches, bites and licks, the inflamed itchy skin gets secondary opportunistic bacterial and fungal infections, which exacerbate the itching, scratching, licking….odors and discomfort….and the cycle continues, getting worse and worse. While the symptoms of atopy in people are hay fever, eczema or asthma, and while dogs and cats do get bronchitis and asthma, just like people; the symptoms of atopy or atopic dermatitis in dogs unlike people are instead: itchy feet, itchy faces, itchy arm pits, itchy butts, itchy ears & ear infections. The reason for this is that mast cells are concentrated in those areas of dogs’ skin unlike people, whose mast cells tend to occupy the nasal sinuses and the respiratory tract. These symptoms usually are first noticed between one and three years of age. They are often seasonal (at least at first), but can become year-round in Southern California. Kitty is more challenging and symptoms of allergies are different than dogs. Cats tend to develop respiratory signs such as feline asthma frequently and the distribution of skin leasions is different than dogs. Please see the veterinary partner link below. …..but are finding yourself or your veterinarian administering corticosteroids………whether in the form of injections or pills–it is worth considering testing and hyposensitization/ desensitization. The purpose of desensitization is to “reprogram” the immune system– rendering it less reactive to antigens. A blood test is drawn to identify the antigens in our hospital. A specialist in dermatology can do a slightly more accurate test (intradermal allergy test) in which more allergens are tested, by injecting tiny amounts into the skin and examining it for wheal reactions. Once the antigens are identified, gradually increasing amounts are injected at home in a “cocktail. Initially injections are administered every other day and gradually reduced to one every three weeks. The likelihood of success is 70-85% similar to people undergoing this therapy for allergies. We have yet to run into a person who is not scared of giving their pet shots, as well as a person who in spite of initial reservations just can’t do them. Most are surprised at how easy shots are to give with a bit of practice, and how little the pets mind them, especially if coupled with a treat. The beauty of successful desensitization is that it is free of side effects seen with other drugs used on a chronic basis, and in the right patients are much less expensive and effective than repeatedly treating allergic flair ups with corticosteroid injections, antibiotics, antifungals, home remedies, lotions, potions and pills. Many pets are helped considerably by frequent baths. Antigens adhere to hair and skin accumulating over time. It has been demonstrated that some allergens are absorbed through the skin. Frequent baths reduce the antigen exposure and provide temporary relief usually lasting several days, without the use of any drugs. We stock professional medical shampoos formulated for soothing, cleansing, hydrating and controlling itching. Since dogs’ skin doesn’t produce oils in sufficient amounts to moisturize their skin, when bathed frequently, it is important to follow baths with a good moisturizing conditioner to prevent over drying of the skin, which will exacerbate itching. We advise against blow drying for the same reason. Systemic and topical antibiotics and anti fungals are used frequently on atopy patients who have been scratching or licking. We all have small number of bacteria and yeast coexisting happily on the surface of our skin, but moist inflamed skin with a defective barrier invites these normally harmless organisms to become opportunistic invaders. If you are smelling an odor on the pet it is likely your pet has an infection-healthy tissues don’t smell. If you are seeing a brownish discharge on the nails, hair, skin or inside the ears, you might be seeing and smelling a common fungal (yeast) called Malassezia. The most common bacterial pathogen we see is Staphylococcus. Once either causes an infection, they worsen the symptoms and require topical and systemic treatment. Omega-3-Fatty Acids found in oily fish such as salmon reduce inflammation of the skin in allergic patients (as well as arthritic joints) restore deficiencies of the lipid barrier in skin cells, and are synergistic with antihistamines. Both of these companies are committed to ensuring purity and potency, unlike products found in big box stores. Antihistamines block the histamine release from mast cells, and are effective in about a third of our patients. We suggest trying the older ones first, because in reducing sedative properties in newer generation antihistamines, the potency of reducing itching is also reduced. Also, with the exception of Benadryl, the other antihistamines don’t seem to cause sedation in pets like they do in people. The following are worth trying: Clemastine (generic Tavist), chlorpheniramine (generic Chlor-trimeton), Zyrtec, Benadryl, Claritin. Generic antihistamines are as effective as brand names, and should always be tried with a good quality omega-3-fatty acid supplement. We suggest trying each for three weeks before deciding if it is effective. If the one being tried does not reduce itching in three weeks, try another, just like people with allergies try several before finding one effective for them. Given the relative lack of side effects even if taken long term (compared to corticosteroids) they are definitely worth trying. Be sure to avoid combination allergy drugs which combine antihistamines with decongestants and pain relievers–they are toxic to pets!Quercetin is a bioflavonoid antioxidant found in pigments of plants. It is believed to stabilize mast cell membranes, preventing them from rupturing and releasing the inflammatory, allergy-symptom-causing histamine into the surrounding blood and tissue in response to the IgE antibody. Its absorption is enhanced by bromelain. We order our quercetin from Thorne Research: http://www.thorne.com/Products/Antioxidants-Flavonoids/Flavonoids/prd~SB330.jspCorticosteroids are potent antiinflammatory agents often used to treat patients with atopy by injection or in pill form. All steroids (dexamethasone, triamcinolone/ Vetalog, prednisone, prednisolone, Temaril-P) reduce itching very quickly by suppressing lymphocytes, thereby decreasing inflammation and providing quick relief, but they vary in their potency and duration of effects. Though quite useful short term for temporary relief of itching, they can be terribly harsh drugs when used chronically. As we already know atopy is a chronic disease, therefore we can’t rely on steroids to be the cornerstone of treatment. Their long term use should be avoided due to well known side effects of adrenal suppression, osteoporosis, hypertension, diabetes, weight gain, changes in the liver, predisposition to infections, and skin and hair texture changes. I do use steroids in patients for short term relief and when everything more holistic has been tried and failed, especially if the pet is not very young. On occasion topical steroids, with limited systemic side effects, can be a useful adjunct for spot-treatment.Flea allergies throw a well managed atopic off course. Because allergic pets over react to many many allergens, it is very important that rigorous flea control is practiced. The effort invested in keeping an atopic patient’s symptoms under control will be wasted by a single flea bite! Cyclosporine (Atopica) was introduced as a treatment for allergies in dogs a few years ago. Its original use was as an anti-rejection drug in transplant patients. Although cyclosporine does not cause the same side effects as corticosteroids, when used long term, the drug can cause nausea, and is more expensive than conrticosteroids. Having said that, our local dermatology specialist who has been using the drug for over a decade feels it to be a very effective addition in our allergy tool box. We usually examine the pets’ diet in evaluating pets with skin diseases. Food allergies overlap with atopy in location on the dog’s body and appearance, and can be challenging to diagnose. There are no accurate blood tests for food allergies in pets–diagnosis rests on documented, limited ingredient elimination diet trials. Food allergies are seen with a fair frequency-they typically do not respond to corticosteroids and are present constantly without a seasonal pattern. Even if your pet does not suffer from a food allergy ( and though improving your pets’ diet will not cure atopy) a dietary evaluation is important because poor diet will make treatment of atopy very difficult, if not impossible. Wholesome nutrients, vitamins and minerals are needed for healing injured tissues and for optimal immune system function. Our favorite diets for allergic pets are usually formulated with limited ingredients, do not contain genetically modified grains such as corn and soy, and often contain fish to increase the omega-3-fatty acids. Encase mattresses and pillows in vinyl or semipermeable covers; wash all bedding every one to two weeks in hot water at least 54.4°C (130°F); other desirable measures include: reducing indoor humidity to less than 50 percent; removing carpet from the bedroom and carpet over concrete; avoid lying or sleeping on upholstered furniture. Keep pets away from the bedroom, carpeted areas, and upholstered furniture. Use chemical control measures and remove sources of food and water. Avoid outdoor activities when pollen and spore counts are elevated. Eliminate water leaks and damp areas associated with mold growth; consider reducing indoor humidity to less than 50 percent. Avoid exposure to active and passive tobacco smoke. Consider limiting outdoor activities when air pollution levels are high.